Lately we are struggling with sharing at our house. The 1-year-old is now into everything and the big kids (ages 3 and 5) both have special toys that they love and don't want to share with each other. There is a lot of fighting when my kids aren't respectful or don't use their words to ask to play with these special toys. Over the past few weeks I have been reading a lot about sibling squabbles and teaching kids to share. Today I want to mention a few favorite parenting resources about sharing that are helping us create a more peaceful home. The other day my 5-year-old son grabbed a toy from my 3-year-old daughter without asking. It was her special snake that she was playing with in her room. She proceeded to hit him with a wooden recorder and he hit her back. I hurried upstairs to intervene when I heard screaming and was surprised at how emotional the response was... over a cheap wooden snake. Teaching kids to use their words when interacting with other kids is tough and something we are working on at our house! Helping kids have the desire to share their belongings and communicate about taking turns requires a lot of practice too. 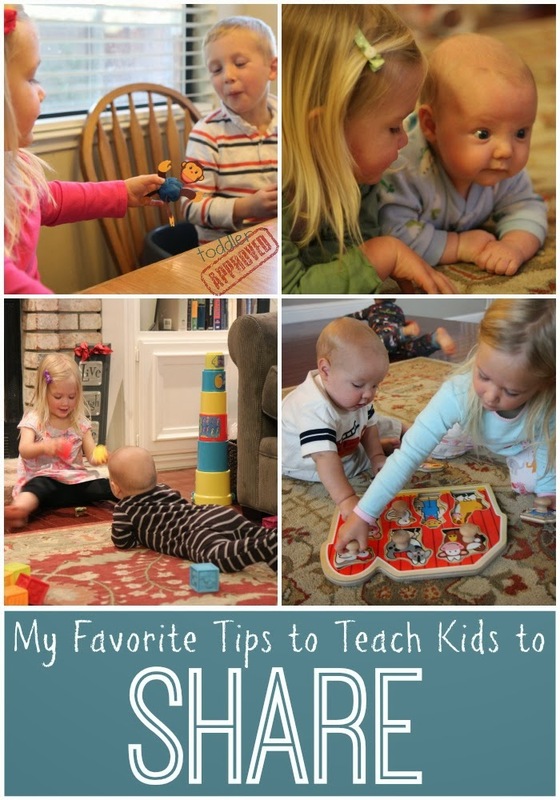 Instead of "sharing" we practice taking turns and I am trying to stop myself from saying things like, "Be kind and share your toys" or other things like that and work harder to help my kids advocate for themselves. In Heather Shumaker's guest post "It's OK Not to Share" over at Positive Parenting Solutions I loved how she talks about using child-directed turn-taking. She says, "Here’s what it looks like in real life. Instead of YOU saying “Five more minutes, then it’s Ella’s turn” teach your child to say “You can have it when I’m done.” This teaches positive assertiveness. It helps kids stand up for themselves and learn to set boundaries on other kids. What a terrific life skill. Then she shares specific words you can help kids say as they are using positive assertiveness and as they are waiting. Love it! Another favorite piece of advice about kids and sharing comes from Dr. Laura Markham at AHA Parenting. 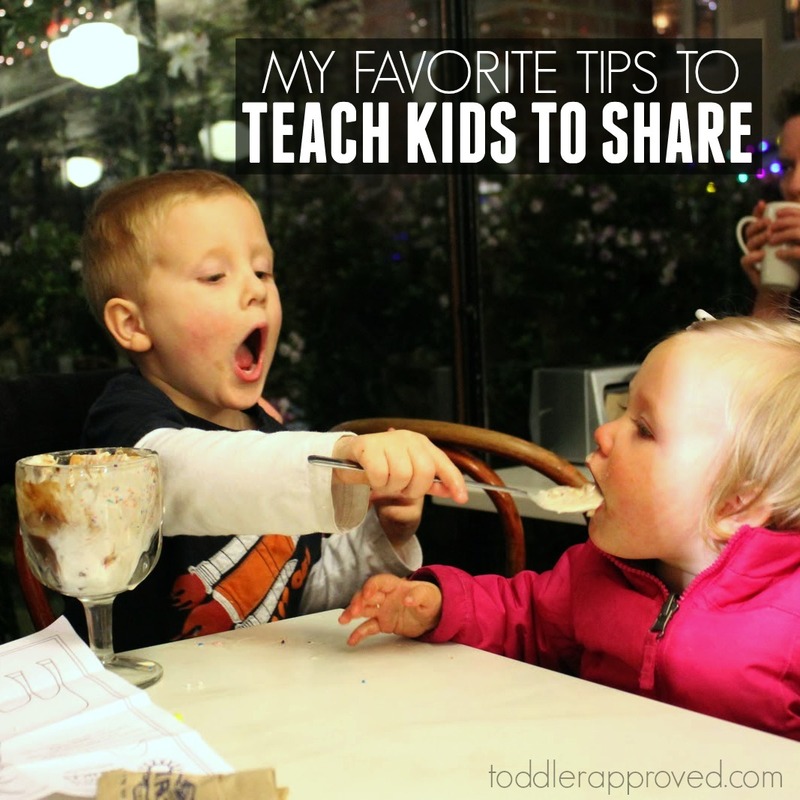 She says, "Don't force toddlers to share; it actually delays the development of sharing skills! Kids need to feel secure in their ownership before they can share. Instead, introduce the concept of taking turns. (“It's Alysha’s turn to use the bucket. Then it will be your turn. I'll help you wait.")." She then goes on to explain in her post called Social Intelligence for Toddlers, how to help kids see the positive effects when they do share, so then they want to do it again. All of her tips are really helpful. Do I do all of the things she mentions all of the time? Definitely not. Sometimes I just take whatever toy is causing conflict and put it in "time out" so that the problem goes away. I think Heather and Dr. Laura's advice applies to kids and adults of all ages. As an adult, I still have a hard time sharing specific things (especially dessert... ask my twin sister and my husband :)) and if someone asks to borrow my personal laptop, I might say no. I think it is important for kids to have things that are their own too. Then, once kids feel secure that they do have ownership of something, we need to help them realize that sharing feels good and makes other people feel happy. Once they have those positive feelings again and again, they will hopefully choose to share. We are still working on taking turns daily at our house. Whenever we find that we are struggling with sharing, we shift gears and do one of these five activities to make the interactions with friends or siblings a little more successful. Do you have any other tips about turn taking, sharing, or sibling squabbles? What are your thoughts on the articles from Dr. Laura and Heather? Any other favorite points that stuck out to you? Want to see more of my favorite parenting resources? Check out my Becoming a Better Parent board on Pinterest. I will definitely head over and read this Jennifer! If I can get my act together and actually have something positive to share I will try and join in at some point :) Thanks so much for sharing this with me!! P.S. I'd love for you to share on the blog one month as part of the series! yes yes yes! agree with you. i hate when the other parents say to my kid - play for 5 minutes and it's my kid turn...hm...not! Hello Kristina, this s something we use a lot at home. For me 'share' is something that can be divided or portioned you share a cake. Most toys can't actually be shared and need to be played with in turns. I dislike it when you hear a parent calling from the other side of the room "share". We take in turns but In the name of fairness and to set clear boundries we often use a timer when the children strugglect decide who should have it they'll ask me to put the timer on then at the end of a 'turn' they just hand it over knowing when the timer goes off next they'll get it back. Having had an equal turn. Very interesting. A much better way to teach kids about sharing. I really loved it.